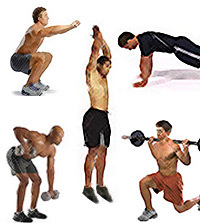 Strength and conditioning exercises for men over 30 revolve around not turning you into a bodybuilder, but rather to increase your strength, energy, and endurance for daily functionality and the prevention of injuries. 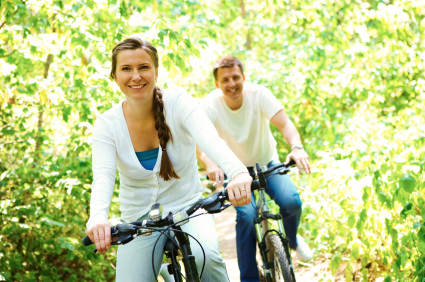 As we age, our bodies naturally experience various changes which include a reduction in bone density, lower testosterone production, a decrease in lean muscle mass, and many other changes. It is imperative therefore to get regular exercise via a balanced strength and conditioning program. Exercise is similar to medications. Without the proper dose of exercise, you receive little benefits for your body, but too much exercise is basically toxic for your body as well. However, the appropriate amount of exercise your body needs produces amazing results. Let’s first take a quick look at how strength and conditioning can reverse the aging of your body, what exactly strength and conditioning is, and how often men over 30 should be exercising. 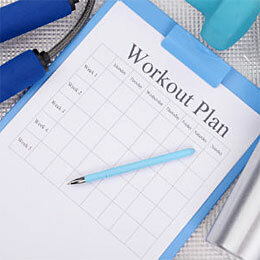 Finally, let’s then dive into 10 of the best exercises to add to your routine! Can Exercise Turn Back Time and Reverse the Aging of Your Body? You can possibly reverse the aging of your bones and muscles with strength and conditioning exercises for men 30+ since they cause your muscles to become microscopically torn, and after they repair themselves new cells begin to form and create stronger muscles and bones. Research shows that even men over the age of 70 greatly benefit from resistance training by allowing this to happen, and this even will apply to a man that has lived a sedentary lifestyle most of his time on earth. What Exactly is Strength and Conditioning? Strength and conditioning exercises are often misconstrued with power lifting and heavy weight training, which are not necessarily related to this at all. You perform these exercises in order to strengthen your muscles, bones, and organs to keep your body’s physical performance in top condition. Strength training is not the only portion of this since plyometrics, core stability, endurance, and agility training are also thrown into the mix. Research has proven that men over the age of 30 benefit greatly from all forms of exercise, therefore it is recommended for anybody that is medically capable of performing physical activities to do so regularly. Aerobic training used to be the only method used for people who are aging, obese, or recovering from injuries. The thought process was keeping your heart and lungs healthy enable you to live better. One problem with this is that your muscles in the upper body suffer from little usage, and something needs to be done in order for your body as a whole to be healthily maintained. How Often Should You Physically Exercise Your Body? 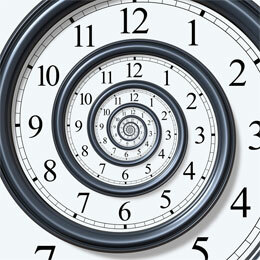 As mentioned previously, you have to exercise routinely for a certain timeframe each week. People often assume exercising for 15 minutes a day is good enough, but the problem with this is that you do not get much from such a brief timeframe, and HIIT is usually not the best alternative since it is pretty intense for your specific age group. Sure, some men over the age of 30 can still perform extreme exercises, however, let’s focus on most of the population than the few. Aerobic training (cardio) is recommended to be performed 3-5 days a week for a minimum of 20 minutes to a max of 60 minutes. Then you have weight training, which is also referred to as resistance training, is recommended to be performed 2-3 days a week for 20-30 minutes. People often mix the two categories of strength and conditioning for 3 days of the week since this allows you to properly train your body as a whole and have plenty of rest days for recovery and growth. However, this applies mainly to those over 50 years of age, so 30-50 year old men should strive to train 4-5 days a week. There are dozens of exercises to consider for strength and conditioning, and you should feel free to switch exercises in and out every other week to prevent your body from getting into a routine and not benefiting from the training as much. The exercises chosen for you are the top ones to get your body in the best shape as a whole. None of these exercises are really isolation based since that is not what you need, and are instead focused more on compound training. Compound exercises are the best choice since they target multiple muscle groups instead of just one or two like isolation training. Your core also needs routine training since it keeps your balance in great condition, and is capable of allowing you to train properly and harder. Let’s take a look at these exercises and get you started on the right path! Planks are by far one of the best calisthenics (bodyweight) exercises to perform for strength and conditioning. This exercise focuses on increasing your body’s strength, balance, and endurance as well. The simple exercise seems easy to perform, but holding the proper form of a plank is rather difficult, and many of people perform them incorrectly. There are plenty of great guides available for you to perform the plank properly, and you should always research any unfamiliar exercise prior to performing it physically. Barbell squats are a compound lift that focuses on your trunk primarily, but your core and upper body receiving training as well. You want to use a moderate amount of weight when it comes to strength and conditioning since you need the proper training fatigue on your muscles, but do not want to allow any injury to your body. It’s imperative that you perform barbell squats correctly to prevent injury to your knees and lower back. A great tip would be to never lock your knees, always keep your chin up, and puff your chest out. This exercise is great for targeting your core muscle and hip flexors. There is another version known as the hanging leg raise, which is where your basically hold onto a pull-up bar or something similar in order to raise your legs and perform the movement. However, this can place a lot of strain on your shoulders, and should not be performed too often. The lying down version takes away this shoulder strain and allows you to focus more on the primary muscles it is meant to target. The Elliptical is an exercise machine that encourages aerobic training while also adding in a little strength training as well. A treadmill or running on the ground creates impact on your knees and legs, which can cause wear and tear further down the road. However, the Elliptical takes this impact away by using platforms under your feet, and grasping the bars to move your feet generates strength in your upper body. As mentioned previously, the amount of time to use this fine piece of equipment is 20-60 minutes. This is also good for using after resistance training to decrease lactic acid buildup. Push-ups primarily focus on your upper body strength, but your core and leg muscles play a major role as well when it comes to balance. The primary muscles being focused on are you chest, shoulders, triceps, and biceps. This is another calisthenics exercise and requires you to perform a decent amount of repetitions since your body is the only type of resistance being placed on your muscles. You should strive to perform at least 50 push-ups in a row. The deadlift is often performed by power lifters since it increases your body’s explosive power while also strengthening your muscles and balance. You do not need a lot of weight to perform this exercise for strength and conditioning purposes, and proper form plays a large role in keeping your body safe from injury. You never want to “roll” your back to perform the exercise, or lock your knees either. Primary muscle groups this exercise focuses on are your leg, hip, lower back, and abdominal muscles, but your upper back, shoulders, and arms are used as secondary muscles. Basically your entire body is at work! Roll ups are one of the least performed exercises that revolve around your core muscles and hip flexors. Usually the only people who really know about this exercise these days are the ones who were asked to do them for their training routine, or those focusing on their lower abdominal muscles. The exercise is performed like the lying down leg raise, but the difference is your bringing your upper body to your legs instead. The best tip for this exercise would be to breather out as you roll your body forward, and inhale on the way back like with most exercises. This was a great shoulder based exercise created by one of the most well-known bodybuilders Arnold Schwarzenegger. Your shoulders are made up of three muscles heads, and all of them need proper attention in order to keep your shoulders strong and capable of performing everyday movements that strain them. The Arnold dumbbell shoulder press allows you to target all three muscle heads throughout the exercise because it is a mixture of two movements. Other muscles used for this exercise are your arms, traps, and abdominals as well. Kettlebells are one of the best types of equipment used for both aerobic and strength training. Their unique and awkward shape cause a lot of unused muscles to be used during an exercise, and the kettlebell squat swing is also a compound exercise since it targets your entire upper and lower body. The two-handed method is best to be proficient in before trying to one hand swings. A quick tip to remember is to keep a firm grasp on the kettlebell and clear the area in front, below, and behind you to prevent injury. 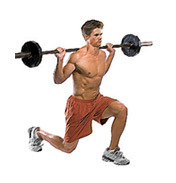 Your final all around best strength and conditioning exercise to perform is the lunge. This exercise is similar to the squat, but has great benefits for improving your overall leg strength and balance as well. The reason why is because a lot of people use squats for their primary focus, and always perform their sets of lunges pretty mediocre. They are similar, yes, but should be thought of as exercises that give different outcomes. Your balance should be able to greatly improve if you perform lunges properly and every other week add them somewhere into your workout program. As you can see, your arms were not greatly focused on with these exercises. The reason why is because your arms get a nice workout in with every upper body exercise you perform, and even barbell squats assist with the growth of the muscles within your arms. They are a pretty small muscle group in comparison to the rest of your body, and do not require a lot of exercises to get them stronger. However, if you wish to throw in some exercises focusing on this muscle groups, you should perform biceps curls, triceps extensions, and triceps press downs. Your body is not getting any younger. Sure, the age of 30 sounds like a pretty young age to be worrying about anything happening, but truth be told – it is better to start sooner than later. Studies show that a man at this age could already be experiencing a 1% decrease in bone density and muscle tissue if they are not already performing strength and conditioning exercises, and the percentage increases each year with age. Prevent this from happening by starting as soon as you can! In addition to strength and conditioning exercises, stretching is also highly recommended and should be performed for 2-3 days a week for a minimum of 5-10 minutes. This allows you to keep your joints range of motion functioning properly and possibly will prevent training injuries. You can be performing an exercise correctly with good posture, but a joint that has not been warmed up properly may fail to fully make its range of motion and pain will follow. Strong Fit Living Brian is a Marine that has become a certified personal trainer and nutritionist. He has written for numerous publications over the past eight years as a freelance writer on topics such as muscle building, weight loss, healthy eating, and more. His eBook for sale is Slim Strong Fit Exercise Programs.